We went fruit picking again on Monday and picked, amongst other things, over 2kg of strawberries! We have eaten some and today I used the remaining berries to make strawberry jam. Place in a large heavy bottomed saucepan with the lemon juice and heat for 10 minutes until the fruit is soft. Using the back of a spoon crush some of the fruit to release the pectin. I crush most of the berries as my kids like a smooth jam, however you can crush as few as one-third. Once a set has been reached skim off any froth that has risen to the surface. Remove the pan from the heat and leave to stand for 5 to 10 minutes. Stir to distribute any larger pieces of fruit. Pour into sterilised jars and seal immediately. Store for up to a year in a cool dark place. *There are a few ways to test for a set. You can use a thermometer to check the temperature, Setting point is reached at 105ºC. Alternatively you can do a “wrinkle test”. Spoon a little jam onto a chilled plate (I place a small plate in the freezer as I start cooking). Leave it to cool for 2 minutes, then push the jam with your finger. If the top wrinkles the jam is set. 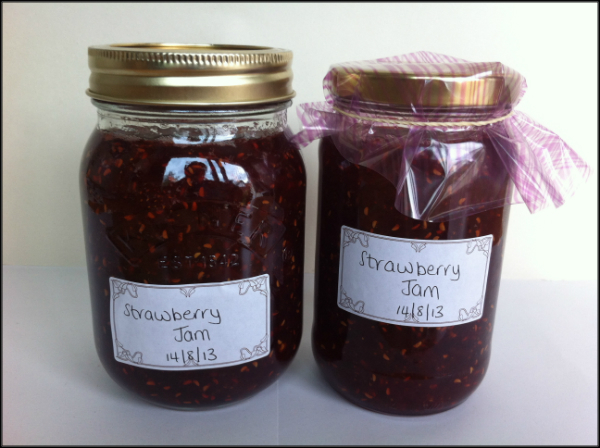 If it wrinkles only a little or not at all continue boiling the jam for a little longer (2-5 minutes) and test again. Love it!! I always thought jam was hard to make. I can’t wait to give it a try now! !